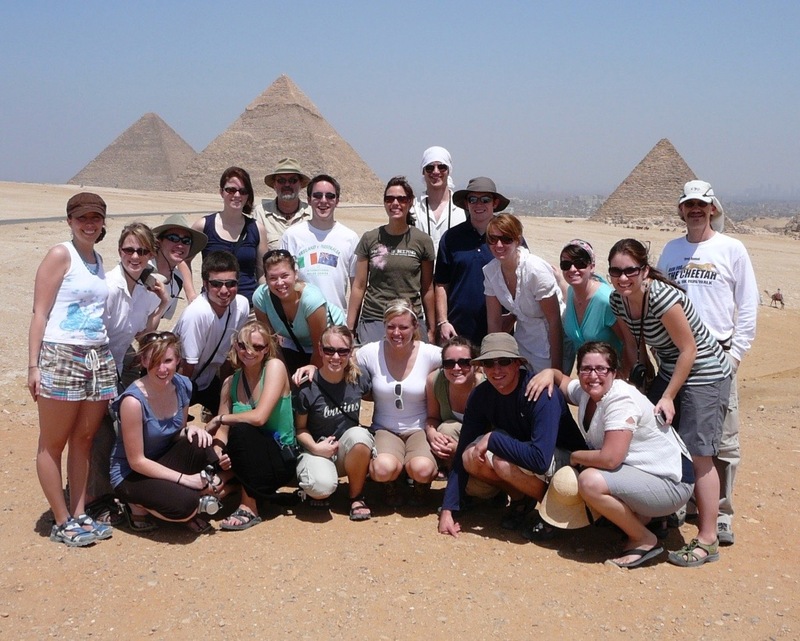 This proposed Juniors’ Abroad trip will focus on providing foundational knowledge of the history and culture of Egypt. We will emphasize the place of Christianity in a Muslim world and archeology, such as the building of the Pyramids in Egypt. These are two diverse topics, but together they will provide an introduction to both ancient and modern Egypt. While the majority of Egyptians are Muslim, approximately 10% are Coptic Orthodox Christians. Of special interest will be the visits to Coptic and Muslim Cairo. No study of Egypt would be complete without studying the Great Pyramids of Egypt. As one of the most recognized structures in the world, these ancient wonders of the world will provide a glimpse into ancient Egypt, their engineering practices and their religious practices. Egypt also provides a fascinating and diverse landscape from the sand dunes of the Western deserts, to the fertile Nile valley, to the Red Sea in Egypt. Students will have opportunities to explore the history of Egypt with visits to the Pyramids of Giza and the Valley of the Kings in Luxor, visit Aswan, the temple complex of Abu Simbel and other archeological sites. In addition we will take a cruise on the Nile, climb Mt Sinai, snorkel in the Red Sea and visit Siwa oasis in western Egypt. Note: Due to current safety concerns this itinerary may change by May 2020. Arrive in Cairo. After breakfast visit with your Egyptologist tour guide the Egyptian Museum. Tour to the Coptic Quarter in old Cairo, visiting the very old Coptic churches, then onto Islamic Cairo, see the Fortress of Salah el Din & Mohamed Ali Mosque Lunch at a local restaurant Then visit El Sultan Hassan, El Refaay & Ibn Touloun Mosques then transfer to the train overnight on board south to Aswan. Arrive in Aswan. Visit the Nubian museum and the Unfinished Obelisk, Visit Nubian Village. Get up very early and follow the convoy to Abu Simbel, visit the temple, transfer back to Aswan, check in to Nile Cruise. Free at leisure to visit Aswan. Visit the High Dam, and Philae temple. Sail on cruise to Kom Ombo, visit the double Temple shared by “Horus & Sobek” the crocodile God. Sail to Edfu and over night. Visit the most complete and entirely Greek Temple of Horus in Edfu. Sail to Esna, sail again to Luxor. Disembark (end of cruise) then visit the west bank, visit the Necropolis of Thebes where we visit the tombs of the ancient pharaohs in the Valley of the Kings. Then continue to visit the temple of Hatshipsut and the Colossi of Memnon. Visit the east bank (Karnak and Luxor temples). After dinner take a buggy ride through the country side around Luxor, board the train back to Cairo and overnight on board. Full day tour with our Egyptologist tour guide. Visit the 4500 years old Giza Pyramids, the only remaining wonders of the ancient world. Also see the Sphinx carved from a single stone representing a creature with a Pharaohs head and a Lion’s body. Then continue to visit runes of the ancient city of Memphis continue to visit the stepped Pyramid in Sakkara that is the oldest ever construction of hard rocks made by man. Depart to Saint Catherine and the Sinai by an a/c bus. Experience mountain Moses (Mt Sinai) and watching the marvelous sunrise. Drive to Dahab on the shores of the Red Sea. Dahab and snorkeling on the reefs of the Red Sea. Transfer to Alexandria. Free time in afternoon and evening. Visit the Kata Comb, Roman theatre and Alexandria Library. 4 x 4 ride through the Great Sand Sea from Siwa, swim in an oasis pool, watch the sunset over the desert, have dinner then back to hotel. Early morning transfer to airport for final departure to the US.